Audit and Assessment off the needs and risk associated. Define a services life cycle and understand its impact on the organization. Integration Methodology & framework recommendations. 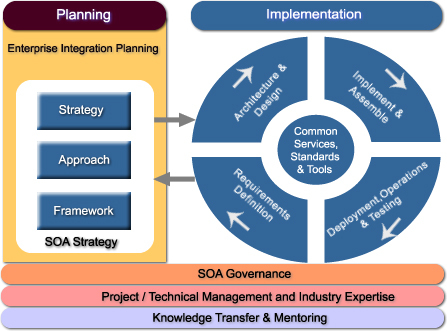 Detailed recommendations that the customer can use to make decisions on how best to execute and evolve Service Oriented Architecture (SOA) and integration strategy by leveraging our unparalleled experience. Evolve an enterprise architecture that meets both business and IT requirements.